Waymo will be testing self-driving cars in the SF Bay Area. Safe? I don't know, but you wonder compared to the ridiculous drivers texting down the road. And perhaps a way to "pack cars" into "tight traveling groups" to help address the crushing commuter traffic in SF Bay Area. Time will tell. Interested in the patenting of self-driving vehicles in the European Patent Office (EPO)? I suggest reading the IP Watchdog interview: Exclusive: A Conversation on Self Driving Vehicles at the EPO with Roberta Romano-Götsch. 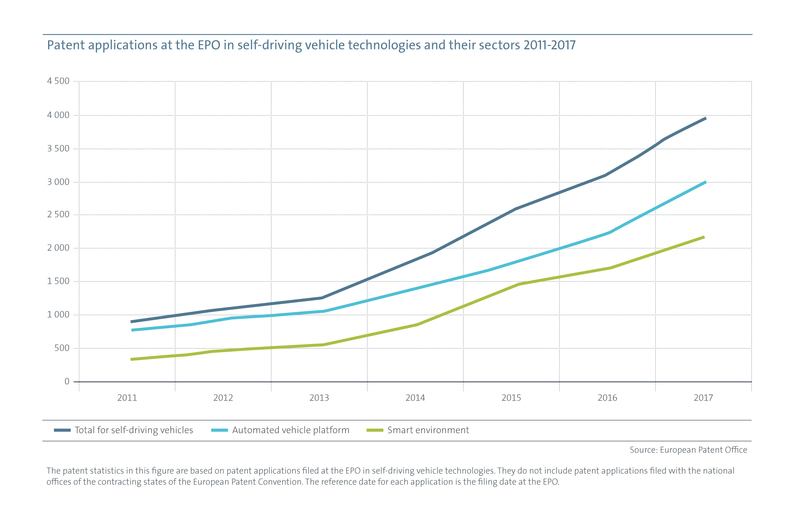 It contains an interview with an EPO official, an EPO Study Patents and Self-Driving Vehicles (2018), and a graph showing the increase in EPO filings from 2011-2017.